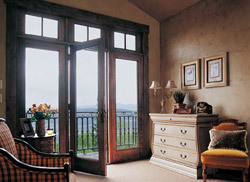 French doors bring in natural light and provide a functional and traditional elegance to any home. And used on the inside, they make a great transition between rooms by providing a sense of privacy yet maintaining the feeling of openness. If you’re considering adding French doors there are a few things to consider. French doors have 2 panels that either swing in or swing out. The arrangement of your furniture and the layout of your room will play a large role in determining which style works best. If you have chairs or sofas in the path of travel then an out-swing door would be a better choice. However, both doors don’t have to open at the same time. A door with a fixed panel on 1 side will still provide the traditional look of a French door and may allow the door to swing in. In the past, exterior French doors were notoriously poor when it came to weatherization and security. However, today’s newer doors have multiple areas of weatherstripping and usually come with insulated glass so they are as energy efficient as a sliding patio door. Keep in mind, unless you have an awning or significant overhang, in-swing doors have the potential to bring moisture into the home when opened during rainy weather. And, for security, most doors come with a “three-point lock” with rods that penetrate the head and sill as well as a deadbolt that locks both panels together. For warmer days screens are available that mount to the jambs and pull out like a mini blind. You can open the doors and still keep the bugs away! So, if you have a deck or garden area you love to visit on warm mornings or you need a spacious entry for parties, or if you simply want to create a quiet interior space for reading or study, French doors may be for you. Acrylic sheets are an excellent alternative to glass in certain situations. Acrylic is sometimes known by the brand names Plexiglas, Lucite, or Acrylite. Polycarbonate is a heavier, stronger version of the typical acrylic sheet and is often called by the brand name Lexan. There are several applications where acrylic or polycarbonate may be a better choice than glass. Impact resistance is one of the main advantages of acrylic. In most cases it qualifies by code as safety glazing for hazardous locations like doors or sidelites. Areas like playhouses, greenhouses, or sheds are excellent uses for acrylic. It also weighs less than glass making it easier to handle and transport, especially if you have a large sheet. It is very easy to load an entire 4’0” x 8’0” acrylic sheet safely into the bed of a pickup. You will definitely not be successful doing this with glass. As a side note, polycarbonate is increasingly popular for bullet resistant applications for its lighter weight and lower cost when compared to glass in these situations. Acrylic is great for home projects because it can be fabricated much like wood. Table saws, jigsaws, and standard wood drill bits can all be used to shape and assemble projects. Special care needs to be taken to keep it from cracking but if you practice drilling or cutting first with some scrap, you should have good results. Acrylic glue or cement is also available for joining corners and works like a solvent to melt the acrylic together. Get some advice from a professional if you plan to go this route. Lining the pieces up together prior to gluing them is a key. The main drawback to acrylic is that it scratches easily. Leave the paper masking on while doing any fabrication and until you are ready to install it. Plastic cleaners are available that will help minimize scratching but rubbing a soft cloth to remove dust will leave fine scratches. For these reasons, glass still works better for most pictures frames and display cases. 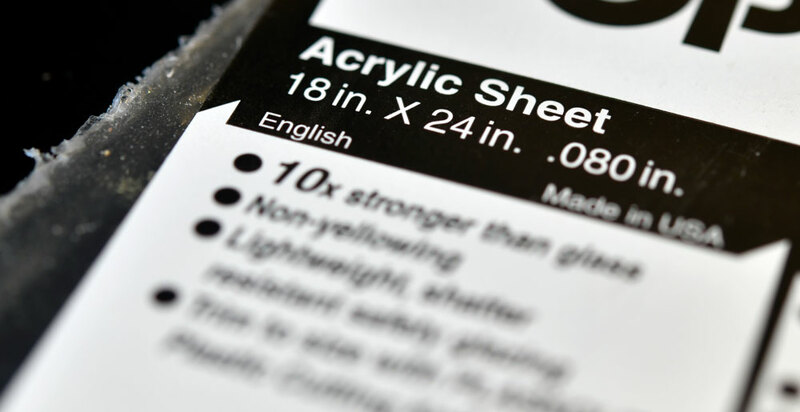 Stop by our Corvallis or Albany showrooms or give us a call with any questions regarding acrylic sheet. We would love to hear from you! In recent posts, we’ve discussed using mirrors to create the impression of a larger living or dining room. Using glass shelving, as opposed to traditional wood or metal, is another way to make a space feel larger and more airy. It is especially useful in small spaces to make a room feel more open. In darker spaces, glass shelves brighten a room by allowing light to pass through and makes the room feel less cluttered. And, if you store books or pantry items on an upper shelf for example, a quick glance will tell you what’s on those shelves. No step ladder required! Displaying art or other keepsakes on glass shelves allows them to take center stage and be seen from all angles. Using decorative glass containers for toiletries and storing them on glass shelves works great in bathrooms and especially small powder rooms where careful design considerations need to mesh with functionality. Kitchens are another outstanding place to incorporate glass shelving. Similar colored cups and plates create art on their own and are functional as well. However, not every kitchen item lends itself to display so a good mixture of open and closed shelving makes the most sense. How you hang the shelves is an important design element. The simplest way is to screw brackets to the wall like a traditional wood shelf but don’t be afraid to be creative. Brackets are available that attach at the wall to give the glass a floating appearance. And, hanging systems using cables or wires deliver a sophisticated industrial look to any space. For the best results, you should use tempered safety glass since it’s about 4 times stronger than regular glass and always get the edges polished. Polishing will remove the sharpness and proide an elegant finishing touch. Most glass has a green look at the edge but if this bothers you, opt for a “low iron” glass that is virtually clear on the edge. If you’re considering using glass shelves, be sure to check with us for the right glass thickness and hanging options. Want to protect your antique wood table or desk? How about making a small dining room or home office feel larger yet still be functional? Incorporating a glass table top into your home design may be just what you’re looking for. Scratches on wood tables or desktops are annoying and extremely difficult to remove. Clear glass can be custom cut to fit your table or desk. Glass allows the beauty of the wood to shine while providing a protective cover that’s easy to clean and maintain. The edges can be polished or beveled to give the table a sophisticated look. And, in the future, if a scratch develops, you can replace the glass much easier than refinishing great-grandma’s wood table. Tempered safety glass should be used for larger dining room tables since it will resist scratching better than regular glass and it’s much harder to break. Also, since it’s heat treated in the tempering process, it will stand up to hotter dishes from the oven than regular glass (but still use a hot pad!). In addition to protecting existing tables, glass can also serve as the table itself. You will want to use thicker glass for this, anywhere from ½” to 1” thick depending on the size. Glass tables add a modern and contemporary look when combined with a simple metal or wood stand. A round glass table top with a bowl of fresh flowers or a candle will really set off a room. And, having a clear table or desk will make a small space look and feel larger. Glass table and desktops aren’t just for your home. This clean and edgy design is making its way into many offices and reception areas. Lately, it’s common to see reception counters made from traditional laminate or wood but have glass set above it on standoffs and cantilevered out past the counter. This stylish look gives customers a solid writing surface and minimizes the damage to the counter in high traffic areas.